Once upon a time, there was a neat little Greek tavern that majestically stood out among the monotonous buildings along Kingsway across from Central Park. However, big bad Translink (well, it wasn't named that back then) came by and built an ugly-looking chunk of concrete in front. The subsequent Skytrain line helped obscure Minoas from passing motorists. Sure, you can still see it; however, it just ain't the same. It's been a very long time since I was last here. That was before marriage, kids and a mortgage. Back then, the Entertainment coupon brought me in. Thi s time, it is a result of Elaine (Parker Pages) organizing a little blogger rendezvous. Joining us tonight was Chris (Mr. Elaine), Jessica & Mark and Kim. Oh, and we brought our Entertainment coupons as well. Finally, I'm getting use out of the book! 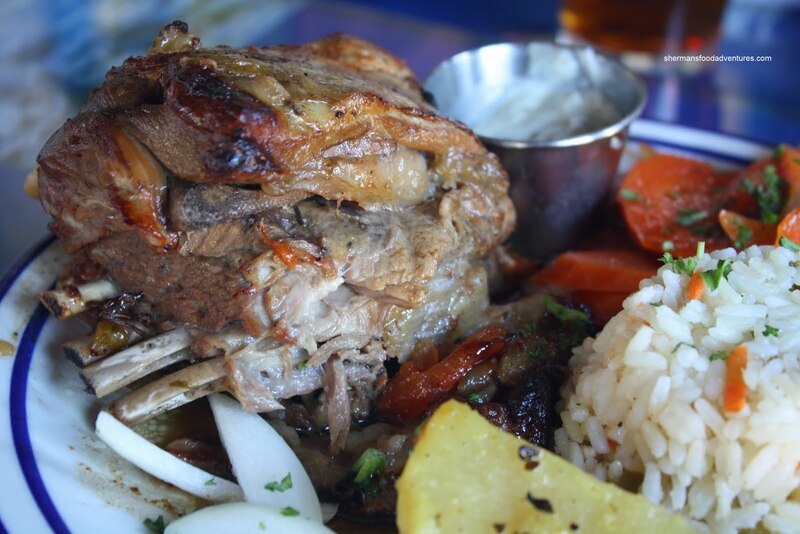 Since it was a Tuesday, the roast lamb was on special for $13.95. In order to use our coupons, we had to order it at regular price. With that, we saved an extra $1.00 compared to the special. Score! LOL... They allowed us to use 3 coupons for our party of 6. I mention this because some restaurants don't allow for this, even though they do not state it on the coupon itself. On a side note, I find this very deceptive and unethical. If you don't want to honour coupons that bear your restaurant's name, then DO NOT even bother offering them! This was the case with Red Fort. Viv had gone with some friends and the did not accept more than one coupon. Despite no stipulation on the coupon itself or any warning on the menu. So I give Minoas kudos for accepting them all. 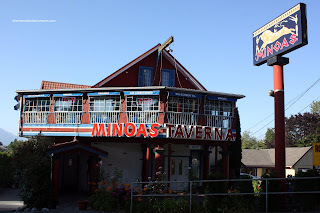 Now, if you ever talk to people who have been to Minoas or just merely read any online review, it is quite obvious people either like the place or don't like it. Not much in between. Apparently, the reason for this is inconsistency. Jessica and Mark confirmed this since their last meal here was not very good. In addition to our individual meals, we shared an Appetizer Platter to start. 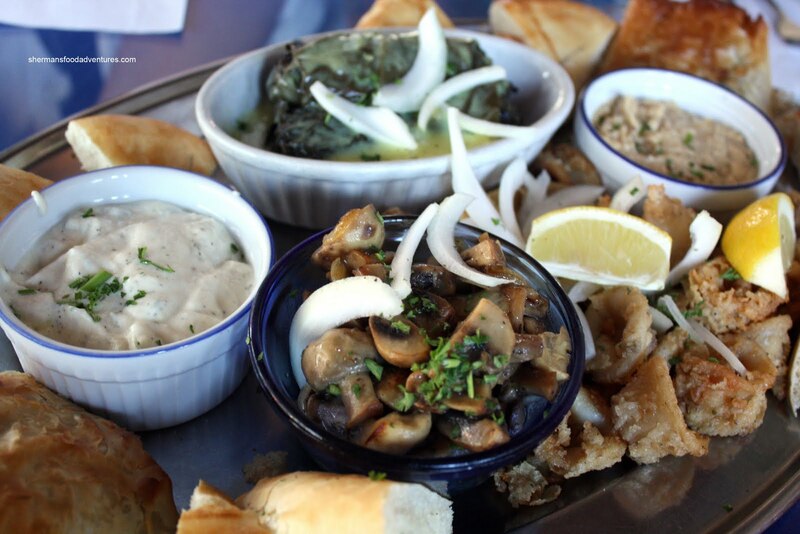 There was Spanakopita, Dolmathes, Manitaria, Humus, Tzatziki, Calamari and Pita Bread. It was a decent portion; but as Mark stated, there should have been more for $28.99. 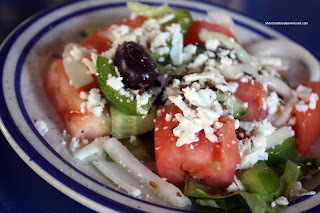 For me, the dolmathes were very good. Filled with plenty of beef, it was very flavourful. I particularly liked how the filling wasn't too wet since there was a lemon sauce on top already. The calamari was quite tender; but the batter was not as crisp as I would've liked. The Spanakopita was crisp and the filling was tasty with a nice onion flavour. I only wish there was more filling. I really enjoyed the manitaria (mushrooms). Once again, well-seasoned and cooked perfectly. 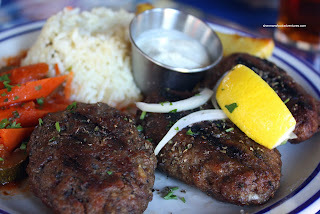 Both the humus and tzatziki were full of flavour, in particular lemon (which I really like). Mark and I both had the Kleftico (roast lamb) and was it ever a huge portion! The meat was very tender and moist. Moreover and most importantly, it was well-seasoned with hints of garlic and lemon. As for the sides on the plate, I wasn't exactly that enthused. The rice was both bland and overcooked. The lemon potato was overdone as well and quite greasy. It did taste quite good though. The veggies were alright still retaining some texture. Since we are all food bloggers, we all decided to give each other samples. Kim opted for the Moussaka. I thought it was executed very well. 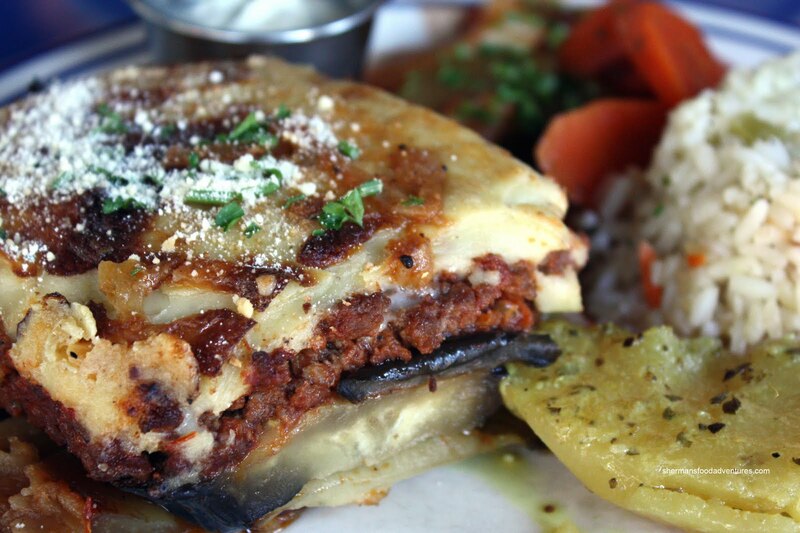 The thick slices of eggplant did not disintegrate; hence, every layer was discernible. I also liked that the modest layer of bechamel. Sometimes, it's just too thick; thus overwhelming the dish. Elaine had the Biftekia (ground beef patties) and for once, they were not a charred and chewy. Surprisingly, they were very moist, juicy and flavourful. Jessica went for the Paidakia (lamb chops). I must've had a really good piece because it was super tender and juicy (again with good amount of seasoning). However, everyone else remarked that it was dry and overcooked. 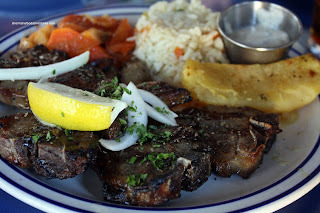 So except for the lamb chops, most of the food was quite well-executed and well-seasoned. From this visit alone, I would conclude that Minoas is a solid choice for Greek food; but keep in mind that others have not been so lucky. RE the entertainment book coupon, some restaurants do not want to honour it because they didn't sign up to be in the book. They might have signed up for it the first time, but it seems that the E-book people automatically renew the coupon to perpetuity. JS, that may be true; however, it would be nice that they put a little disclaimer or note at the entrance or on the menu. I really hate the places that spring it on you when you are just about to pay. Very dishonest. "RE the entertainment book coupon, some restaurants do not want to honour it because they didn't sign up to be in the book. They might have signed up for it the first time, but it seems that the E-book people automatically renew the coupon to perpetuity." Wow I didn't know that. That sounds like the Entertainment Book folks are kind of ...... disorganized, to put it kindly. Did they have any belly dancing? Elaine, do we really want to scare away all the customers? this place is still there? i remember going as a kid! sounds like it hasn't changed much. i like how it's in a big house, there's something novel about dining in a place like that. i miss going here for hummus and calamari. LR, it's disorganized to say the least. E-books and similar types of businesses ask businesses to pay a fee to be listed in the book. You would think that they'll only list the business if they pay, but they'll list them anyways. To perpetuity, on the online sites that people can print the coupons over and over again. I can understand why some restaurants don't want to deal with the coupons -- and deal with some customers who keep wielding these coupons. Not directed at you, Sherman, but you wouldn't believe some of the hassles that go with these darn coupons. Trisha, I was surprised it was still there too. I kinda forgot about it! JS, that's too bad ENT is so poorly run.